Old friends came up to spend a few days with us at the Homestead over the past long weekend, which made for a heck of a lot of laughter, hijinks (mental note: do NOT give Dave the slingshot again), late nights around the firepit and lots of good food. As much as we hated to see them off on Monday, it was probably a good thing as all that laughter was killing me. Saturday’s dinner menu was French (Chicken Cordon Bleu, roast carrots with garlic and roasted mini red potatoes) followed by Sunday’s Mexican fiesta of rollos del mar (rolls of the sea; fish topped with chopped shrimp and wrapped in Serrano ham), Charro Beans, fresh corn on the cob, pico de gallo, tomatillo salsa and rice. To polish off Mexican night, I made individual Peach Crisps, which has nothing to do with Mexican flavours, but I wanted something small and light so as not to leave guests feeling like they have over-indulged. As we are smack in the middle of peach season, it was only fitting to highlight the aromatic, fuzzy skinned fruit in a light and tasty dessert. Served in individual ramekins, there was no need for anyone to be tempted to go back for seconds. 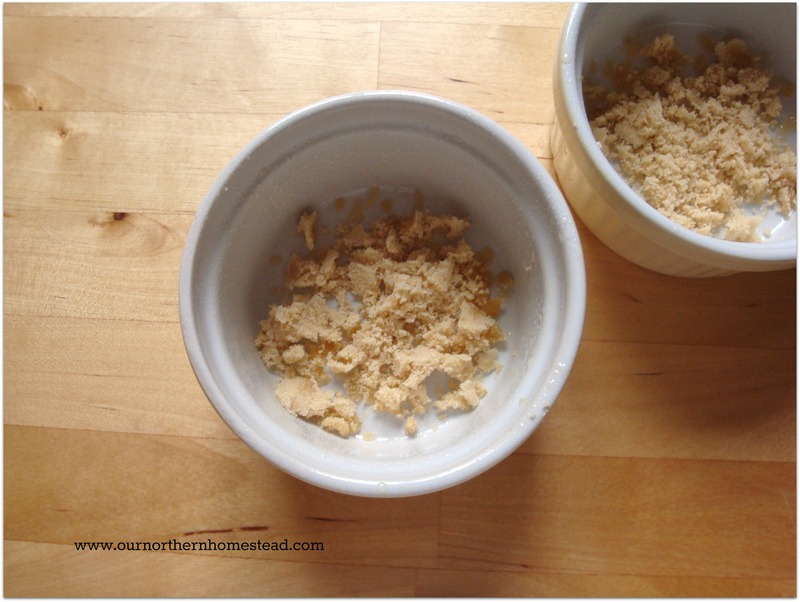 In each ramekin (that has been sprayed with non-stick spray), sprinkle one tsp of brown sugar in the bottom. 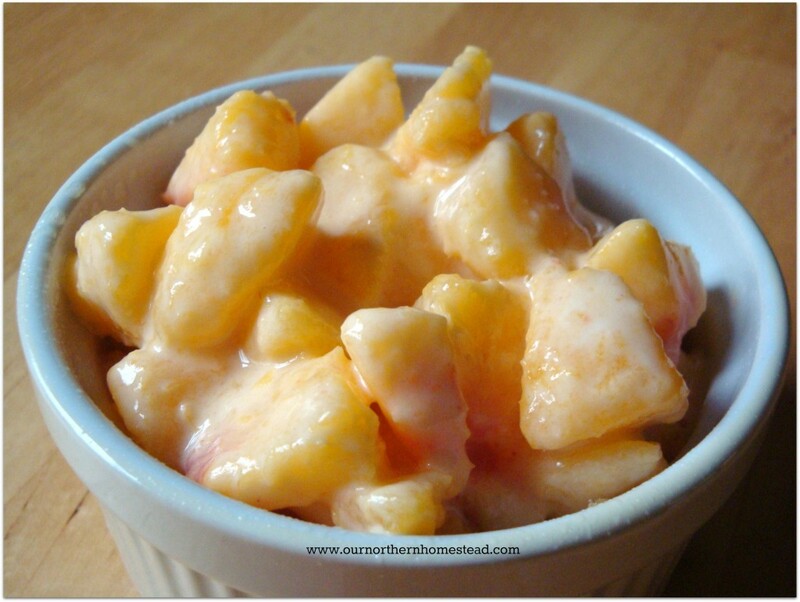 Combine chopped peaches with the cornstarch and mix well. Divide evenly among the ramekins. 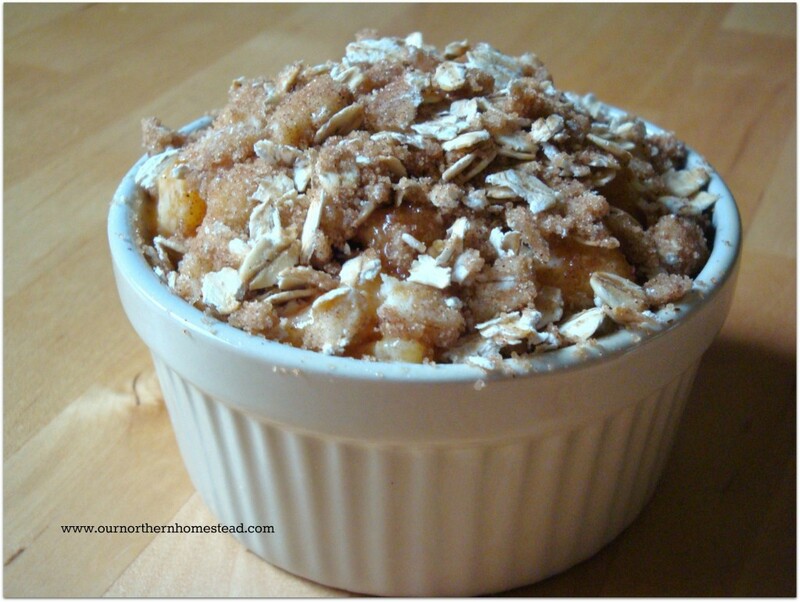 In a small bowl, combine remaining ingredients and mix well. 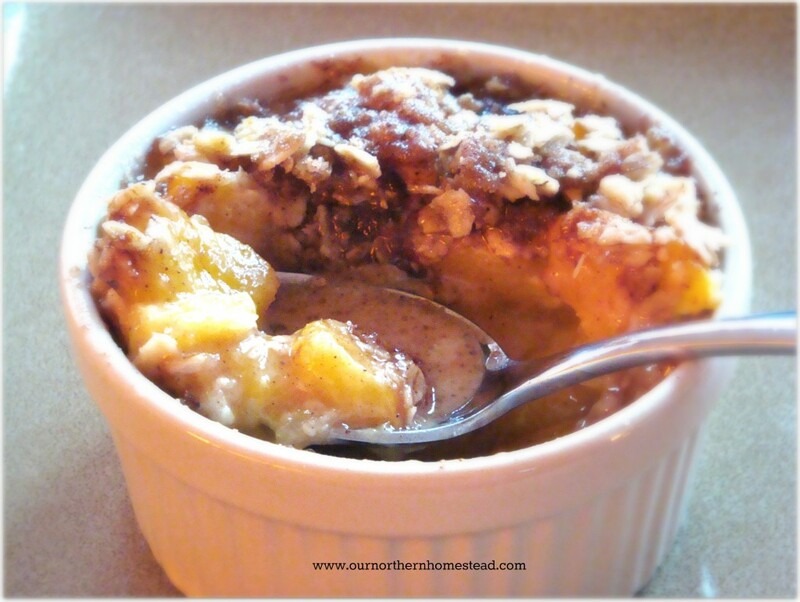 Divide evenly among ramekins, topping the chopped peaches to cover completely. Place ramekins on a baking sheet and bake in a 350°F preheated oven for approximately 25 minutes. Remove from oven and let cool for about 10 minutes before serving. Serve with fresh whipping cream if desired. But hold the slingshot. The amount of butter say 1/4. Is that 1/4 cup or 1 stick out of the 4 sticks? So sorry for the tardy reply. It should read a 1/4 cup, going to edit that right now!